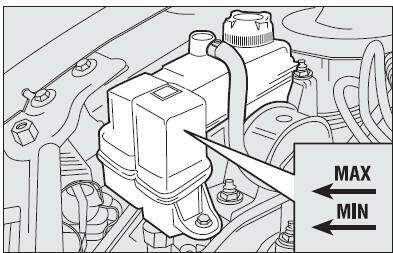 The coolant level shall be checked with cold engine and shall be included between the MIN and MAX mark on the reservoir. If the level is low, pour slowly a mixture of 50% distilled water and 50% FL Selenia PARAFLU UP through the filler neck. A 50-50 mixture of PARAFLU UP and distilled water gives freeze protection to –35°C. 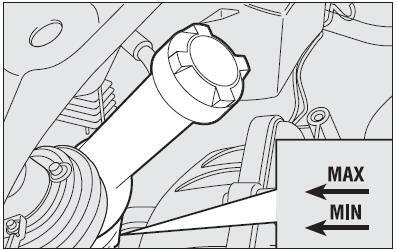 Do not remove the reservoir cap when the engine is hot: you risk scalding yourself. PARAFLU UP antifreeze. Do not add fluid having different specifications from that already existing. PARAFLU UP cannot be mixed with other types of fluids. Should other fluids be added, do not start the engine and contact Fiat Dealership as soon as possible. reservoir cap when the engine is hot: you risk scalding yourself. pressurised. If necessary, replace the cap only with another genuine one, otherwise system efficiency could be compromised.